Membrane-Based Separation in Metallurgy: Principles and Applications begins with basic coverage of the basic principles of the topic and then explains how membrane technology helps in the development of new environmentally friendly and sustainable metallurgical processes. 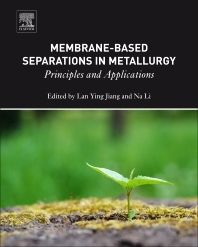 The book features the principles of metallurgical process and how widely the membrane-based technology has been applied in metallurgical industry, including the basic principles of membrane-based separation in terms of material science, membrane structure engineering, transport mechanisms, and module design, detailed metallurgical process flowcharts with emphasis on membrane separations, current process designs, and describes problems and provides possible solutions. In addition, the book includes specific membrane applications, molecular design of materials, fine tuning of membrane’s multi-scale structure, module selection and process design, along with a final analysis of the environmental and economic benefits achieved by using these new processes. I am now working at the School of Metallurgy and Environment, Central South University (CSU) in China. CSU has strong background in metallic material and metallurgy. The school has established a separation and purification platform that focuses on the research in membrane-based separation for hydrometallurgy processes and a center for wastewater treatment specifically addressing heavy metals. In recent years, many good ideas and publications about membrane application in metallurgy and heavy metal waste treatment have been delivered by the researchers in the school. I am a key member of the platform and the center. My current and upcoming research effort is concentrated on 1) membrane preparation and optimization for Forward Osmosis, Nanofiltration, Pervaporation and Membrane distillation, and 2) membrane applications for the green development metallurgical process. Before came to CSU, I worked as a (Senior) Research Fellow from 2005 to 2009 at the Nanoscience and Nanotechnology Initiative (NNI) of National University of Singapore (NUS), and carried out research in “Sub-nano Pore Size Membranes for Biofuel Separation and Purification” and “The Development of Mixed Matrix Nano-composite Materials for Membrane Separation”. From 2002 to 2005, I was awarded the research scholarship to pursue my doctoral studies on “Membrane Formation and Characterization for Gas Separation” at the Department of Chemical and Biomolecular Engineering of NUS. I got my PhD in 2006. I received my B.Sc. degree (1997) from the Department of Environmental Science, Wuhan University, China. As 1st and major inventor, I have applied 3 US patents, 1 Singapore patent and 9 China patents, 3 of them have been authorized. 22 papers have been published in Journal of Membrane Science, Chemical Engineering Science, Carbon, Progress in Polymer Science etc. I have given more than 20 oral presentations at international meetings or conferences related to membrane separation and material science. Expert in the fabrication, testing, characterization and application of separative membrane, especially for UF, membrane distillation and pervaporation processes. Engaged in the development of membranes and their application to environmental engineering, chemical engineering, biological engineering and the food industry, such as separation and purification of Chinese traditional medicine, industrial waste water treatment and preparation of drinking pure water. Research Center for Eco-Environmental Sciences, Chinese Academy of Sciences, Beijing, China. Courses Taught: “Chemical Separation Engineering” for 3rd year undergraduate students; “Selected Topics on Chemical Separation Engineering” and “Membrane Science and Technology” for graduate students. Supervisor of three Ph.D. students and four graduate students at present. 20 graduate students have obtained master degrees. Research area: Enantioselective membrane bioreactors for the production of pure enantiomers.